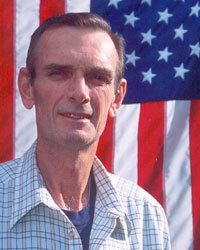 Rembert Gary (Gabe) Rollison was born July 29,1943 in Jesup, GA. He grew up in Hinesville and graduated high school from Bradwell Institute in 1961. He received his commission upon graduation from North Georgia College in Dahlonega in 1966, and completed the Infantry Officer Basic Course, Airborne School and Ranger School that same year. On July 2, 1966 he married Martha White of Gainesville. After finishing the Ranger Course in September, he was assigned as an instructor at the Mountain Ranger Camp, and in January, 1967, completed Jungle Warfare School in Panama. Gabe served two tours of duty in Vietnam, with the 4th and 25th Infantry Divisions in 1967-68 and with the 101st Airborne Division in 1970-71. His awards include two Silver Stars, two Bronze Stars, the Soldier's Medal, the Meritorious Service Medal, two Air Medals, four Army Commendation Medals with "V" Device, and the Vietnamese Cross of Gallantry with Palm. In 1971, after returning from his second tour in Vietnam, Gabe was one of the few Infantry officers selected to attend the Armor Career Course at Ft. Knox, KY. After that he taught Military Science at Kemper Military School and College in Boonville, MO, and in 1974 was again assigned to the 101st Airborne Division at Ft. Campbell, KY. He completed Command and General Staff College at Ft. Leavenworth, KS in 1978, a one-year tour in Korea, and an assignment with the 4th Infantry Division at Ft. Carson, CO before receiving orders for Alaska in 1983. His last assignment was with Joint Task Force Alaska at Elmendorf AFB, where he retired from active duty in 1987. After his 20-year career in the military, Gabe held several positions in the civilian sector, including: Security Officer for Alyeska Pipeline Security Co., Exxon's Air Terminal Supervisor during the Exxon-Valdez oil spill cleanup, Quality Control Manager for Space Mark, Inc on Adak Island in the Aleutians, and Emergency Planner for the Municipality of Anchorage. In July, 2000, he was diagnosed with pancreatic cancer and fought his last battle with great courage and dignity. He died October 4, 2000, and was laid to rest with full military honors by his fellow Rangers on October lOth in Gainesville, GA.
Gabe was a dedicated soldier, loving family man and faithful friend. He was a hero to many, in his personal life as well as in service to the nation, and he is greatly missed.